You are here: Home / artist to artist / How Do You Approach Art-making During Times of Emotional Distress? How Do You Approach Art-making During Times of Emotional Distress? Recently, WBUR had a story about how events out of our control – such as the recent election – create stress and internal turmoil that can disrupt all aspects of our lives. For artists creating (or trying to create) new work, this can mean a serious disruption of their art-making process. We asked artists, How do you approach art-making during times of emotional distress? My work for years has been about emotional distress, both mild and pathological, and the coping mechanisms we use to self-soothe, so you’d think I’d have all the tools I need. Based on the research for my recent work, what I should be doing is going for long walks in the woods and taking deep breaths of forest air. What I’m actually doing, however, is sitting on the couch reading about how much better I would feel if I went for a walk in the woods. But if I’ve learned one thing, it’s that you can’t beat yourself up for slowing down occasionally – it only compounds the misery. When I don’t have it in me to hit the studio I do small things in the direction of productivity. I research and I plan for future projects. And I look for non-art tasks that feel productive as well, like studying Spanish. I’m currently living in Providence, which has a large Latino population. I feel like I need to find ways to better connect with people in my community right now, and learning another language, even at a basic level, will help me do that. There are always emotions. Some of them are more uncomfortable for me to be with than others. Some, like elation, feel really good but interfere with my ability to write – elation wants the external and so I’m out doing, not home writing! Fear, sadness, insecurity, they pose different challenges. Seeming bottomless (they never are), they threaten to take over the executive self and with it, all those evolved capacities of the human brain – like perspective – I rely on to write. I like to sit with a difficult emotion and feel where it’s lodged in my body, then find out what’s underneath. Take fear (often in my lower abdomen). Fundamentally, it’s a lack of basic safety, so I look for that safety in tangible ways and identify what is trustworthy and supportive — my bones, my breath, the chair I’m sitting in. Simple stuff. I like to give structure for the emotion, a house I’ve built for it to roam around in, because the emotion itself isn’t the problem, it’s my reaction to it. Always, in the end, I find myself in the same place at the end of this process — back to the work. My writing comes out of those very same vulnerable places where sadness takes root — where all emotions do — and yet is also one of the sources of stability that gets me through. In times of emotional stress, not only making art, but also viewing art can provide a much-needed emotional release. Often my most productive periods are when I feel a need to disconnect with my own internal stressors and reconnect with life that is happening around me. Grabbing my camera and going for a walk breaks up a physically sedentary day but also an emotionally clouded one. Street photography is unique in that it allows the artist to be present with the world in a way that working in a studio cannot. It shifts our role from being a participant to being an observer. Working on the street has a unique duality: the sometimes frustrating challenge of dealing with the unforeseen but also the excitement and reward of capturing the serendipitous. Events out of our control and uncertainty therefore become positives. By paying close attention to unpredictable actions and emotions of others in fluid environments, we are forced to focus less on our own internal thoughts to capture external narratives in real time. I always saw the camera as a powerful tool of connection. Making street portraits of strangers whose personalities and places in the world are different from my own, forces me to engage with others and learn from them. It presents the challenge of making their unique, internal story come to the surface through a portrait. There is no time for subjects to look in the mirror, change clothes, fix hair or put on make-up, and I can’t ask the sun to change or the clouds to move… I am forced to make art from what is before me. And in that reality, I make my most powerful work. Jodie Mim Goodnough is a Providence, Rhode Island-based artist whose work revolves around the use of images in psychology and psychiatry, and includes photography, sculpture, performance, video and sound. Recently, she received a 2017 Rhode Island State Council on the Arts Fellowship in Photography and was named a 2017 Traveling Fellow by the School of the Museum of Fine Arts and Tufts University. Her work will exhibit in Building a Lineage at Piano Craft Gallery in Boston, January 2017. 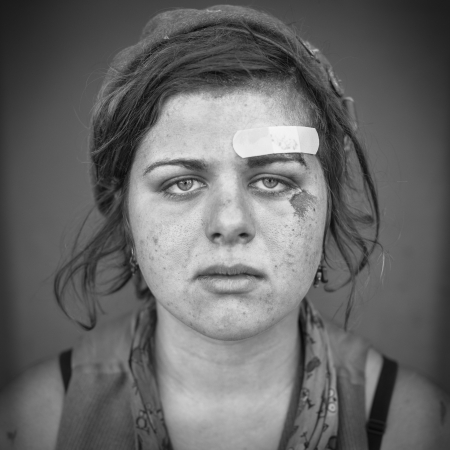 Michael Joseph is a street and street portrait photographer. His “Lost and Found” series, which has been featured on CNN, will be included in the December 8 slide presentation night (Dec 8, 6:30 PM) to complement IDENTITY: The List Portraits at The Annenberg Space for Photography in Los Angeles. Recently honored in PhotoLucida’s Critical Mass 2016 Top 50 list, he’ll have work in the accompanying exhibition (Apr 7-May 2 at the Artwork Network Gallery Space in Denver). He has an article coming out in the December issue of the Czech Republic magazine CILICHILI. Find him on Instagram and Facebook. Writer Jessica Reik was awarded a fellowship position in Grub Street’s Memoir Incubator Program, where she worked on the memoir The Fathom-Long Body. Recently, she received a fellowship to attend a Ucross Foundation residency and was named a finalist in StoryQuarterly Non Fiction Prize. On Tuesday, January 17, 2017, at 7 PM, she’ll read her work in an event featuring MCC literary awardees. 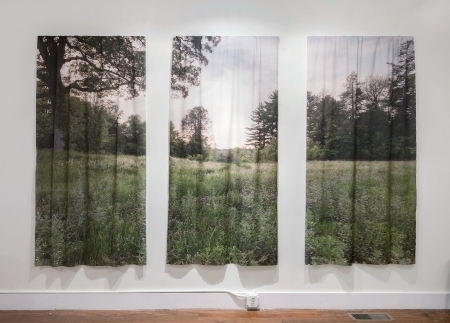 Images: Jodie Mim Goodnough, NORTHAMPTON STATE HOSPITAL (2015) from the PROSPECT project, three Inkjet Prints on cotton lawn, 36×78 in; Michael Joseph, SOPHIE (2013), archival pigment print, 16×16 in. Emotional stress is what fires poetry. Whether personal, political, or international, the poet “feels” the trauma or tragedy and lets it work its way through his or her heart and mind until it often bursts through into words. It can be immediately during an event or months or years afterward. It doesn’t matter when the poem occurs. What matters is the art of the poem, and the message of the poem. And this is the poet’s problem: to insure that the art of the language overrides the emotions of the situation. The poet solves this by locating in the imagination metaphors and symbols for the emotions, for the events of the moment. Otherwise, the poem becomes merely occasional or, even worse, sentimental. While a poem may be composed solely for immediate emotional release, such poems seldom last beyond the moment. Williams Wordsworth in “The World Is Too Much with Us” (1804) bemoans the then current status of human society disassociated from nature in both general and specific imagery, declaring, “Great God! I’d rather be / a Pagan suckled in a creed outworn;” and devolves further into classical mythology with references to Proteus and Triton, he was so disgusted with current affairs, he so longed for connectedness to nature. Today, of course, human society is even more divorced from the natural forces surrounding us, whether coping with climate change or death, itself. Wordsworth’s poem is still relevant, readable, and meaningful today. Recently, for example, my mother-in-law passed. She was the last of mine and my wife’s parents, so this death was especially emotional and meaningful for us. It took me six months to even begin to write about it. My emotions, my wife’s emotions percolated through me until one night I woke from sleep with an image of her lying in the nursing home bed and words followed that I jotted in the journal on my nightstand, and more words followed, then more, until a short poem found itself on the page. Rereading it a day later, I was pleased with it, and more, I was amazed that the language and words were, themselves, non-emotional; though there were specific images and personal references, they strove for metaphorical meaning, above and beyond our own emotions, so that, hopefully, others who read this piece may feel their way through the situation of the poem, and derive meaning, personal and extended, if I was able to transform my emotions and the situation of death into a little piece of art. I won’t know if I was successful until others tell me these words work as poetry. In my role as editor and publisher of Adastra Press, one particular poet I’ve been publishing since 1981, with a new title scheduled for late 2017, is a Vietnam War veteran. Much of his poetry is political, social, and historical. He often walks that fine line between sentiment and sentimental. Sort of like the difference between Van Gogh and Norman Rockwell. More often than not, this poet succeeds and his poetry is the more powerful and moving because of this. The goal is always to take the personal and make it universal. The goal of art is to rise above and beyond the artist.